The General Authority for Islamic Affairs and Endowments announced Haj pilgrims must furnish a health certificate showing they are free of the H1N1 virus in order to obtain an entry visa. The authority’s executive director said “We are joining hands with the Ministry of Health and other local health authorities to lay out the standard health form for the medical fitness certificate. 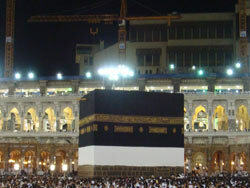 Mohammed Obeid Al Mazrouie, who is also head of the UAE official Haj mission said they have made the health certificate compulsory because the government wants to “ensure health, safety, and well being of pilgrims.” He said that the health certificate will be issued by accredited government health providers, not private health facilities.